Lately I’ve been wanting to bring a little slice of nature to my workspace. Nature always inspires me, and it’s important to try to stay connected to it in anyway we can in this modern world. The obvious solution is of course a houseplant or two, and indeed I do have a couple of those in my office. But I was looking for something a little more evocative. Something that would remind me of grander landscapes and the great outdoors. 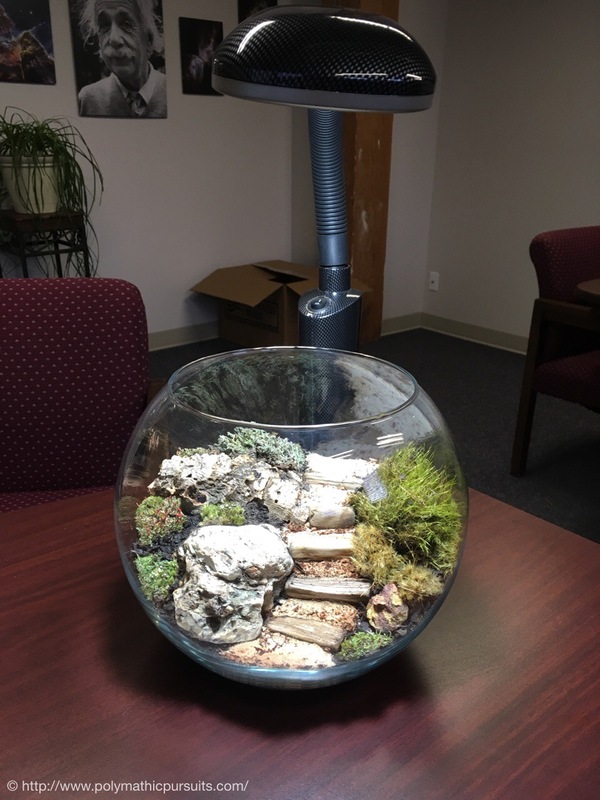 A small aquarium or terrarium seemed the ideal solution, so I set out in search of ideas. I do love the idea of the miniature ecosystems found in properly setup and designed planted aquaria, and they can definitely evoke the feeling of wild places. I’m particularly fond of some of the Japanese styles, such as the “nature aquariums” popularized by Takashi Amano, and the wabi kusa style desktop water gardens. Ultimately, though, an aquarium seemed like it would require too much maintenance. Not to mention the risk of water on a desktop full of electronics is a dicey proposition anyway. So I settled on a terrarium and began playing with design ideas. The end result is pictured above. 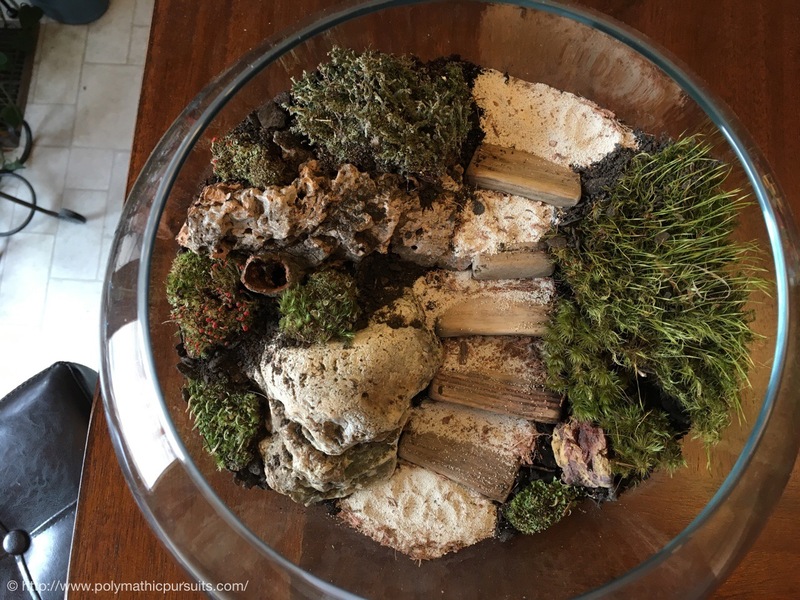 A miniature landscape of moss and lichens, laid out to look like a worn path through some wild landscape. Overall, I’m happy with the result. It will be an interesting experiment to see how well everything survives, and hopefully grows. I chose moss and lichens not just for their appearance and beautiful textures, but because they are excellent reminders of the complexity and mystery of nature, even in the common small places we take for granted. For a beautiful explanation of what I mean, check out this article about botanist Robin Wall Kimmerer’s book, “Gathering Moss”. 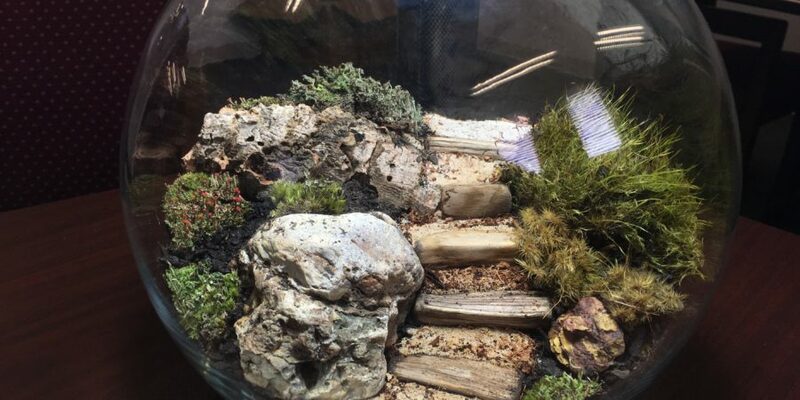 For those interested in the details, the terrarium contains a couple species of Cladonia lichen (British Soldier, Pixie Cup and Pityrea) as well as cushion moss. The hardscape is natural cork bark, small pieces of driftwood and a couple rocks scrounged up from around my house. The substrate is simply unfertilized top soil and sand.